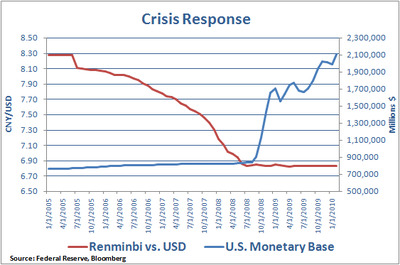 Here’s a great chart from Mike O’Rourke at BTIG, which might seem obvious at first, but which nicely shows how US monetary expansion and the fixing of the Chinese yuan are essentially the same thing — both were the result of each country’s need to respond to the crisis. The good news for Tim Geithner, US manufacturers, and anyone else calling for a yuan revaluation is that as the crisis wear off, so too will post-crisis policy responses. We’re ending our monetary expansion, it would seem, and it’s likely the yuan will begin to float once again.